Aboriginal people have a long connection with the Country of Murramarang National Park, and this continues to the present day. The south coast headlands have long been a focus for economic life, giving easy access to the food resources of both the sea and the land, and plants within the park provided medicines and shelter. There is much evidence of the past today, including shell middens, tool manufacturing sites and indications of a specialised industry producing bone points and fishing hooks. Take a walk around Murramarang Aboriginal Area, near Bawley Point - there's a complex of middens that are of great cultural value. Wasp Head walk This short walk leads to a spectacular view of Wasp Island and passes through historic Aboriginal sites of the area. One of the really special things in Murramarang is the forest of majestic spotted gums; it’s one of the biggest continuous stands in NSW. With an understorey of burrawang palms, the forest stretches right down to the ocean and is truly a sight to see. You’ll easily recognise the spotted gums – they have a smooth, dimpled bark which is shed in summer to produce a mottled cream and grey ‘spotted’ appearance. Dark Beach walking track Dark Beach walking track leads to a secluded beach with unique rock formations in Murramarang National Park. Ideal for fishing, swimming and snorkelling. Depot Beach Rainforest walk Depot Beach marks the start and end of this easy walk through lush littoral rainforest. Go for a swim, surf, snorkel or paddle in the clear waters when you return. Rock Platform walk - Depot Beach Rock Platform walk near Depot Beach is a short walk to fascinating rockpools offering excellent birdwatching and scenic ocean views of the South Coast, just north of Batemans Bay. There’s an abundance of wildlife living in Murramarang National Park, but by far one of the highlights is seeing eastern grey kangaroos that spend their days dozing near the beaches and by campgrounds until dusk when they gather to feed. In the moist forests of the park you might see lyrebirds fossicking in leaf litter. Look for the stately, strutting wonga pigeon with its pastel blue-grey back feathers and black dotted stomach. If you don’t see it, you may well hear its repetitive, deep ‘whoop, whoop’ call that carries through the forest. Burrawang walking track Burrawang walking track, across Depot Beach Headland, features scenic coastal views, forests and birdwatching in Murramarang National Park, near Batemans Bay. Richmond Beach Richmond Beach is one of Murramarang’s hidden treasures. Just 50m from the carpark on an easy walking track you can enjoy picnicking, swimming, snorkelling, fishing and paddling. Birdwatchers are in for a treat; the park boasts more than 90 species of birdlife including three owl species, peregrine falcons, sea eagles, gannets, shearwaters, white-faced storm petrels, sooty oystercatchers, eastern yellow robins, satin bowerbirds, the rufous fantail and even a penguin colony. 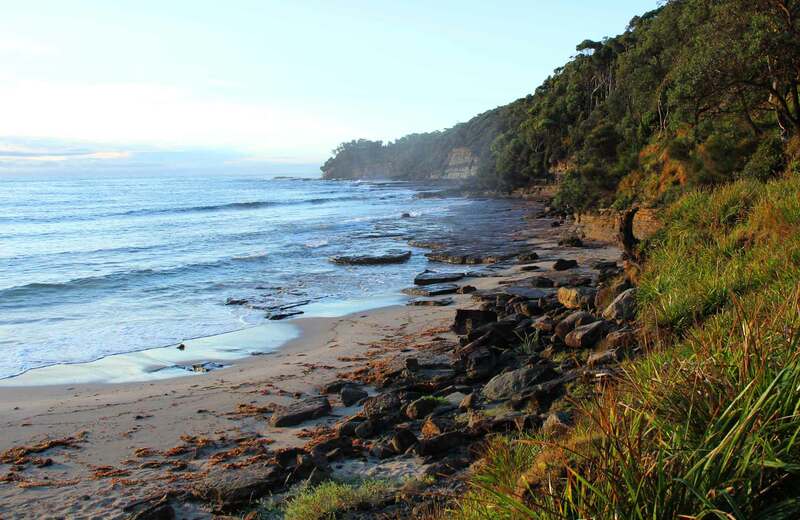 Look for the sea eagles and peregrine falcons soaring above the park’s cliffs and headlands and the rufous fantails and eastern yellow robins in rainforest gullies around Durras Mountain. You’re most likely to see sooty oystercatchers wading around the edges of lake areas.